Check out our Custom Stainless Steel or Carbon Steel Shafts table. Advance Products, Inc. is a premier supplier of custom shafts machining, with over 30 years of experience serving the auto, truck and bus industries. 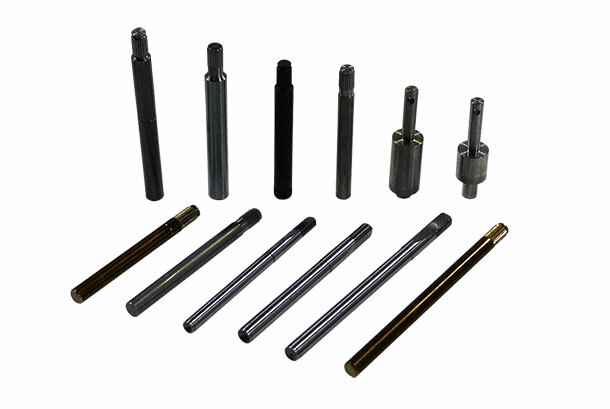 We specialize in manufacturing custom products for OEMs, delivering precision threaded, knurled and plain shafts that meet the unique requirements for each project. We offer both precision screw machine and powder metal parts that meet the highest quality standards, supported by superior customer service. At Advance Products, we understand that the quality and performance of your end products is dependent on the quality and performance of the components and parts you use. Using your product blueprints, our experienced staff will select the most effective method by evaluating your application, part specifications and production volume. We work with your engineering and quality control staff to ensure that your parts meet your exact specifications. We are committed to providing you with a finished shaft that meets or exceeds your expectations, is delivered on time and on budget. Call today to see how we can solve your manufacturing challenge.